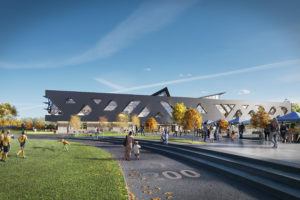 The Clayton Community Centre is designed as a futuristic community centre, combining four aspects of the City of Surrey’s community services—recreation, library, arts and parks in a seamlessly integrated facility. The social fabric of the surrounding context has led to a design that focuses on meeting the needs of youth, while providing key community gathering spaces to support the development of overall community connections. The unique mix of spaces combines arts and culture programming including music studios, recording studios and a community rehearsal hall, with recreational activities including a gymnasium and fitness centre, and a branch library. These key services are supported by a range of shared social spaces and a unique mix of supplementary spaces, imagined and developed in close engagement with the community, that are designed to allow for community-led programming to occur. Clayton Community Centre, scheduled to open its doors in 2019, is also designed to achieve Passive House certification, making it on track to be the first community centre to achieve Passive House in North America and Canada’s largest Passive House facility to date.